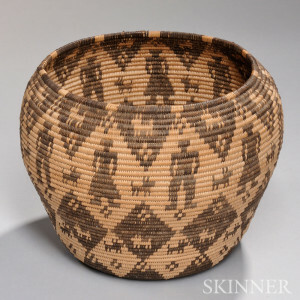 American Indian & Ethnographic Art at Skinner, March 14 | Skinner Inc.
BOSTON, MA – March 2, 2015 – Skinner, Inc. will host an auction of American Indian & Ethnographic Art on March 14th, featuring a wide range of art from Africa, Polynesia, New Guinea and abroad, as well as American Plains Indian material,pieces from the Northwest Coast, Woodlands and Southwest, and textiles and pottery. Plains art accounts for the bulk of the objects available in this sale, with items ranging from moccasins, pipe bags, and coats, to cradles, weapons, pectorals and more. One outstanding offering is a pair of historic Lakota German silver pectorals owned by famed chiefs Red Cloud and Spotted Tail, most likely given to William Starring, a career military man, by the Plains Indians during treaty negotiations at Fort Laramie in 1866 (Lot 190, estimate $20,000–$30,000). Highlights also include a beautiful Lakota beaded hide pictographic coat, circa 1890, which depicts multicolored equestrian figures, warriors and stylized birds (Lot 201, $25,000–$35,000). 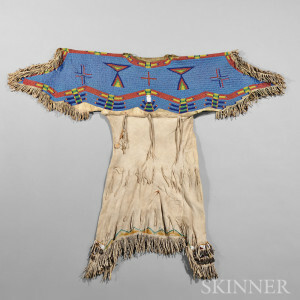 This piece comes from the “Kamp Kill Kare” collection, as does a Lakota beaded hide child’s dress, fringed from sleeves to hem, with a fully beaded yoke (Lot 197, $20,000–$25,000), and a Lakota beaded hide cradle, featuring a cloth lining and an unusual geometric banded design (Lot 123, $8,000–$12,000). Quality moccasins are well represented, with selections including Kiowa man’s beaded hide moccasins (Lot 111, $5,000–$7,000), Arapaho pictorial beaded hide moccasins (Lot 112, $2,500–$3,500), and a pair of Comanche miniature high-top moccasins (Lot 114, $1,500–$2,500), reminiscent of the Kiowa that previously sold at Skinner for $49,200. A remarkable example of Plains weaponry, a Central Plains pipe tomahawk, made circa 1870, showcases a blade with a heart-shaped cutout and a handle decorated with brass tacks (Lot 181, $6,000–$8,000). Northwest Coast material features a range of carvings, textiles and other decorative items, most notably three contemporary polychrome carved wood Hamatsa masks by John Livingston (Lot 261, $10,000–$15,000). A biography and photograph of Livingston holding one of the two raven masks accompanies this lot. Numerous carved spoons will be available, including a Northwest Coast carved and painted wood spoon with its handle in the form of a stylized human (Lot 253, $1,500–$2,000), and a Northwest Coast carved sheep horn spoon, adorned with totemic animals with inlaid abalone eyes (Lot 257, $600–$800).Another notable carving is a Quinalt/Makah carved whale bone adze handle, which depicts a standing bear at one end (Lot 236, $2,500–$3,500). American Southwest Indian art is represented by several sought-after pieces. 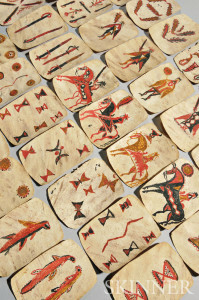 An array of kachina dolls(Lots 263 – 267, estimates vary) will be on the block, in addition to a rare, near-complete set of thirty-nine Apache painted rawhide playing cards (Lot 268, $8,000–$12,000), passed down through a single family since the 1920s. A lovely Navajo squash blossom necklace (Lot 271, $2,000 –$2,500) highlights a strong offering of turquoise and silver jewelry. Also available is a Navajo first phase concha belt, with six oval conchas on original leather pads (Lot 283, $4,000–$6,000). Skinner is pleased to offer a robust selection of New Guinea decorative masks and wooden figurines. A highly unusual lot features two New Guinea fiber and shell bride price payments, both with fiber masks attached to ancient shells (Lot 14, $500–$700). Intriguing carvings include a large Kongo carved wood power figure from the second half of the 19th century, deaccessioned from the Linden-Museum in Stuttgart, Germany, where it was purchased by Milton S. Fox (Lot 65, $40,000–$60,000). Also sure to catch a collector’s eye area Marquesas Islands war club (Lot 49, $20,000–$30,000), an Iatmul orator’s stool (Lot 20, $800–$1,200), a Sepik River carved wood skull rack (Lot 23, $800–$1,200), and a Sepik Gable figure (Lot 22, $800–$1,200). A Chochiti polychrome pottery storyteller figure stands out among a selection of fine pottery at auction (Lot 319, $3,000–$5,000). Exceptional basketry includes a Pomo coiled gift basket from the late 19th century (Lot 352, $5,000 to $7,000), as well as several Apache pictorial creations, highlighted by an Apache pictorial basketry bowl which features bands of human figurines, animals and crosses (Lot 368, $5,000–$7,000). Previews for the auction will be held at Skinner’s Boston gallery on Sunday, March 12th, from noon to 5 P.M., Monday, March 13th, from noon to 7 P.M., and Tuesday, March 14th, from 8 A.M. to 9:30 A.M. The illustrated Catalog for sale #2791B is available from the Subscription Department, at 508-970-3240, or from the Gallery. Prices realized will be available online, at www.skinnerinc.com, both during and after the sale. The Skinner website enables users to view every lot in the auctions, leave bids, order catalogs and bid live, in real-time, through SkinnerLive! and Bidsquare. Skinner auctions draw international interest from buyers and consignors alike, with material regularly achieving record prices. The company’s auction and appraisal services focus on fine art, jewelry, furniture, and decorative arts from around the globe, as well as wine, fine musical instruments, rare books, Asian art, clocks, Judaica, and more. 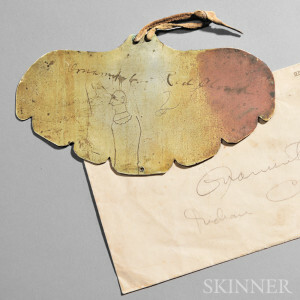 Monthly Skinner Discovery auctions feature a breadth of estate material. Widely regarded as one of the most trusted names in the business, Skinner appraisers have appeared on the PBS-TV series, Antiques Roadshow, since the show’s inception. Skinner has galleries in Boston and Marlborough, Massachusetts, as well as in Coral Gables, Florida, with bidders participating in person, by phone, and online. Join auctions live with SkinnerLive! and Bidsquare. For more information and to read our blog, visit the website at www.skinnerinc.com, find us on Facebook, or follow us on Twitter. This entry was posted in News and tagged 19th century, abalone, Africa, American Plains, Apache, Arapaho, auction, basketry, Beaded, belt, bidsquare, biography, blossom, bone, bowl, Cards, carved, carvings, century, Chochiti, Comanche, concha, cradle, cradles, decorative, Douglas Diehl, fiber, figure, figurines, Fort Laramie, Hamatsa, horn, Iatmul, Indian, inlaid, John Livingston, kachina, Kamp Kill Kare, Kiowa, Kongo, Lakota, leather, Linden-Museum, Makah, Marquesas Islands, masks, Milton Fox, moccasins, Navajo, necklace, New Guinea, northwest, Painted, pectorals, photograph, Pictographic, pipe bags, Plains, polychrome, Polynesia, Pomo, pottery, power, Pre-Columbian, Quinalt, raven, Rawhide, Red Cloud, Sepik Gable, Sepik River carved, sheep, shell, silver, skinner, southwest, spoons, Spotted Tail, squash, Stuttgart, textiles, tomahawk, totemic, tribal, turquoise, weaponry, weapons, whale, William Starring, Woodlands by Skinner. Bookmark the permalink.